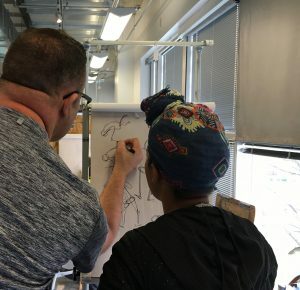 That encouragement was from Dan Holland, an Art Director at Pixar Animation Studios to a group of 20 advanced Art students at UNC Greensboro’s College of Visual and Performing Arts on the weekend of April 5-7. And keep going they did. For hours. Creating hundreds of sketches. On a sunny Sunday afternoon in the Gatewood Studio Arts Building to the sounds of Dave Brubeck’s jazz and the murmured comments of a mentor. A model in the center of the room constantly changed positions, and with each change, the students’ sharpies flew across 11×17 sheets of paper capturing the gestures. All of this under Holland’s expert eye as he walked from easel to easel, sometimes stopping to tweak a drawing. 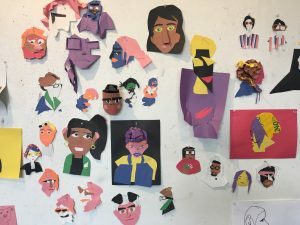 The students are part of the School of Art’s experimental course, ART 391: Character Design Workshop. Dan Holland is a Pixar veteran. Initially hired as an animator, he made the permanent move into the art department on the film WALL-E. Most recently he has served as Sets Art Director for Toy Story 4, which will be released on June 21, 2019. Holland and the students were brought together by Dr. Heather Holian, who taught a class on “The Art of Disney” when she was in graduate school at Indiana University. She brought that idea to UNCG, where she expanded the course to include Pixar. Consistent visits from Pixar artists to UNCG for lectures and workshops have also become part of the course and the School of Art’s offerings. Professor Holian is also currently finishing a book on the artists and collaborative dynamics of Pixar after multiple trips to the studios where she has interviewed artists, worked in the archives and studied the artwork. She says the relationship between the studio and the university, and visits like the one with Holland, are invaluable to School of Art students. This is Holland’s second time doing this type of workshop at UNCG, which teaches the basics of character design through a series of lectures, exercises and critique. The exercises involve collage and drawing. 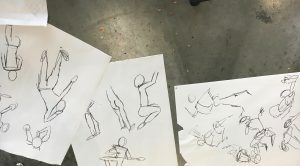 The workshop culminated in an afternoon of gesture drawings where students work on developing clear, readable and communicative poses for characters by studying a live model. Holland says he asks the students to push past boundaries to get to their most creative self. Ansu King is a Studio Arts and Arts Administration double major from Charlotte. He says his instructors at UNCG have been great, but it’s nice to get a new perspective. King graduates this summer and would like to pursue a career in digital art, perhaps at Pixar or another animation studio. His long-term goal is to start his own studio for young aspiring artists. Rachel Meade, from High Point, is graduating in May with a BFA in Painting. She agrees that visiting artists add value to her college experience. Whatever King and his classmates wind up doing, the future for animation at UNCG is looking more and more well drawn. Dr. Holian says the School of Art is in the process of hiring a Visiting Artist in Residence with a specialty in animation or concept art. In the meantime, Dr. Holian will continue teaching her fall semester course, The Art of Disney and Pixar, which is open to all UNCG students and she will continue her practice of inviting Pixar artists to campus for class visits and lectures. For more information about UNCG’s School of Art visit vpa.uncg.edu. The UNCG School of Music is pleased to announce that conductor Jonathan Caldwell has been appointed to the faculty as Assistant Professor of Conducting and Assistant Director of Instrumental Ensembles, effective Fall 2019. 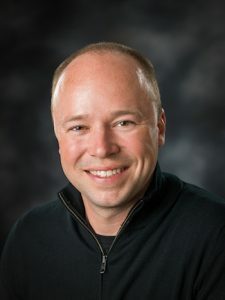 Prior to his appointment at UNCG, Caldwell was Visiting Assistant Professor of Music at Virginia Tech, interim Director of Bands at the University of Wisconsin–Stevens Point, and Director of Bands at Garner (NC) Magnet High School. Ensembles under his guidance have performed at the College Band Directors National Association Southern Division Conference, the National Band Association–Wisconsin Chapter Convention, and in Carnegie Hall. The Triangle Youth Brass Ensemble (Raleigh, NC) won the Youth Open division at the 2008 and 2009 North American Brass Band Association competitions. His writings have been published in the Journal of Band Research and the Teaching Music Through Performance in Band series. Caldwell received a Doctor of Musical Arts in conducting from the University of Michigan and a Master of Music in instrumental conducting from the University of Maryland, College Park. He also holds a Master of Arts in Teaching and a Bachelor of Music in performance from the University of North Carolina at Chapel Hill. Caldwell’s conducting teachers include Michael Haithcock, Michael Votta, Jerry Schwiebert, James Ross, and Tonu Kalam. He has studied horn with Gregory Miller, Kimberly Van Pelt, Andrew McAfee, and Pamela Halverson. Caldwell currently serves on the Board of Directors for the Conductors Guild. He is a member of the College Band Directors National Association, the National Association for Music Education (NAfME), Phi Mu Alpha Sinfonia (Alpha Rho), Tau Beta Sigma (Beta Eta), Phi Beta Kappa, and Phi Kappa Phi. Greensboro, N.C. (April 9, 2019) – The 350-seat recital hall at UNC Greensboro’s College of Visual and Performing Arts has long been known as one of the most visually and aurally stunning performance spaces in the Triad. It will now be known as the Tew Recital Hall in honor of Christopher and Laura Braxton Tew, both UNCG Class of 1969 alumni. The Tews provided a generous gift of $1 million to name the hall, honor the School of Music, and mark the 50th anniversary of the Class of 1969’s graduation. The event to formally name the Tew Recital Hall will be on Thursday, April 11, at 7:45 p.m. and is free and open to the public. The program features compositions by Christopher Tew, including two songs for soprano and piano written while he was a student at UNCG, a piece for viola and piano, excerpted movements from three larger works for strings, and the premiere of “3 Panoramas: Memories of Japan” for string orchestra. The performances will also feature work by UNCG student Shar Joyner, Class of 2019. Laura Braxton Tew grew up on tobacco farms in Pitt County, NC. After graduating from UNC Greensboro she went on to earn advanced degrees from Duke University and Pace University and pursued a career in the chemical manufacturing industry. She worked her way up from bench chemist to corporate director of stakeholder relations, which included global responsibilities. Since retiring, she has been involved extensively in volunteerism and philanthropy, and especially focused on introducing young women to STEM studies and careers. Her work in this area was recently featured in a piece titled “Girl Power” in UNCG’s magazine. Christopher C. Tew is originally from McLeansville, NC and a graduate of UNC Greensboro. A professional composer, Tew was the first UNCG student to ever have his works performed by the UNCG Sinfonia and Symphony. Over the last 50 years, he has composed concert music for school, community, and professional orchestras. 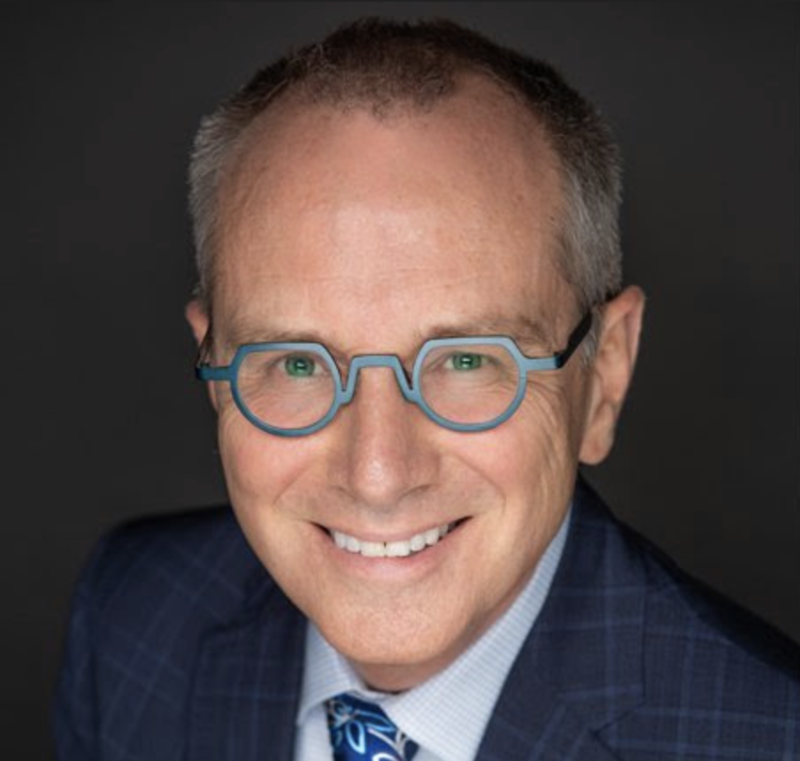 He has received commissions from groups as diverse as Louisville’s Jewish Community Center, Chattanooga’s Girls Preparatory School, the Muncie Symphony Orchestra, and the Chamber Orchestra of Tennessee. His works have been performed by numerous professional orchestras, including the Salisbury and Hickory Symphonies and the NCSU Orchestra, as well as orchestras in Livonia, MI; Lake Charles, LA; West Hartford, CT; and Lone Tree, CO, as well as featured in a festival in Lviv, Ukraine. The Bratislava Symphony Orchestra in Slovakia has recorded two CDs of his compositions, including most of the works featured in the dedication program. UNC Greensboro, located in the Piedmont Triad region of North Carolina, is 1 of only 50 doctoral institutions recognized by the Carnegie Foundation for both higher research activity and community engagement. Founded in 1891 and one of the original three UNC System institutions, UNC Greensboro is one of the most diverse universities in the state with 20,000+ students, and 2,700+ faculty and staff members representing 90+ nationalities. With 17 Division I athletic teams, 85 undergraduate degrees in over 125 areas of study, as well as 74 master’s and 32 doctoral programs, UNC Greensboro is consistently recognized nationally among the top universities for academic excellence and value, with noted strengths in health and wellness, visual and performing arts, nursing, education, and more. For additional information, please visit uncg.edu and follow UNCG on Facebook, Twitter, and Instagram. High Renaissance and Maniera, 1480-1600 during the Spring of 2018.